A troop of young Cub Scouts are heading out for a weekend camping trip and their chaperones decide it will be fun to tell this group of boys about Kai, the boy living in the woods who turns into a werewolf at night. These kids are at that magical age where this kind of story is just believable enough to overthink it when you hear strange noises in the woods, but brave and logical enough to brush it off as nonsense. Sam is the token odd kid out and he’s also the only one who completely believes in Kai. Especially after he sees him. Maurice Luijten inhabits the character of Sam with an impressive balance of sadness, naiveté and chutzpah. After catching a glimpse of a feral young boy wearing only tattered shorts and a mask, Sam takes it upon himself to search out this alleged werewolf. As tends to be the case with kids, both Sam and Kai are equally intrigued by one another and a sweet, but potentially dangerous, dance begins between the two. The first three quarters of Cub are a really lovely ‘creature in the woods’ story told in the same spirit as Stand By Me and The Goonies and it’s almost impossible to not fall in love with Sam and want to protect and take care of him. There is one problem, though. Sam’s history is sketchy and the only thing we learn about him is that he had a traumatic and violent upbringing. How will this upbringing inform his choices at the 44:30 minute mark? Well, if you’re an animal lover, just fast forward from here until 46:50. I cannot stress enough that this scene is on par with the turtle scene in Cannibal Holocaust and as much as it pains me to say it, the scene does, in fact, make sense in the overall plot. The moment that Sam and Kai bond over violence is the moment that Sam chooses his future self. This is also the point in the movie where they kind of lost me and it has nothing to do with the animal violence. There is another nefarious element in these woods and when the film turns it’s attention to him, it feels as though the entire tone and direction of the film changes. I imagine this guy is the brother of the guy in High Tension, you know, if he were real. In itself, I suppose this part of the story could be interesting on it’s own, but it kind of disrupts the magical feeling that was going on between Sam and Kai. While I’m a fan of knowing very little about the “whys” of a killer, this character felt tacked on and unnecessary. The scenes of violence and gore are few, but they are pretty great. Candyman ain’t got nothing on one of the deaths in Cub and there is an eye gouging that goes perfectly with the Suspiria ringtone on one of the characters’ phones. The score on the film helps to create a magical and ominous feeling while the beautifully bare bones budget simply adds to the realism. 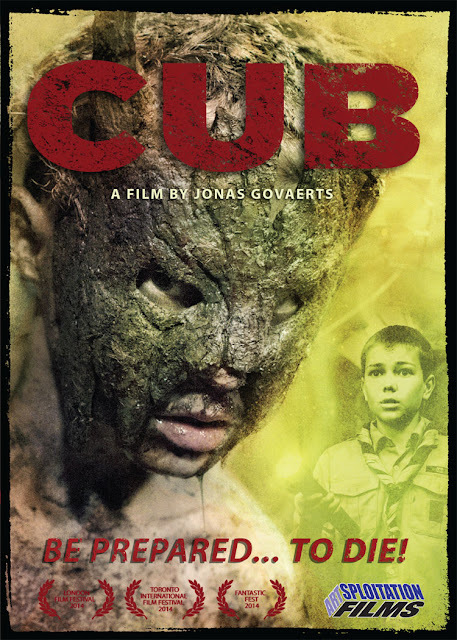 Despite not breaking any new ground, Cub feels fresh and that’s enough for me to forgive the seemingly extraneous character and mildly dumbfounding third act.